From the exquisite beauty of Calacatta marble emerges PreciousHDP, a collection from Florida Tile that captures the essence of the most sought after natural stone in the world. Inspired by the unique marked graphics in the Italian stone, PreciousHDP is a distinct expression of refined taste. Intense grey and brown veins stand out from a crystalline white background endowing it with a depth and movement that enlivens spaces. The random pattern, the structured surfaces of the decors, and the natural and glossy finishes are elements that elevate any atmosphere – classical or modern. 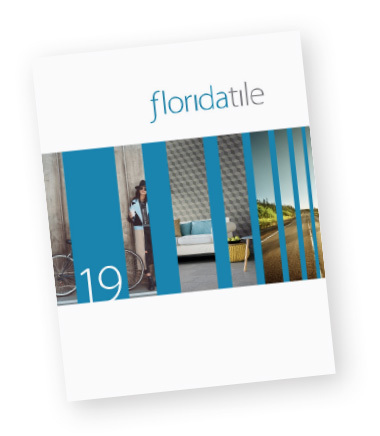 Rectified, porcelain floor tiles in a natural finish are available in 12x24, 24x24, and 18x36. Rectified, ceramic wall tiles in a glossy finish are available in 5x14(cut), 14x27, and 14x39. Two mosaics: a 12x12 ceramic wall tile showcasing a modern mix of the glossy and matte finishes combined in an elongated hexagon pattern, and a 12x12 herringbone pattern in natural finish suitable for wall or floor, provide endless design options. PreciousHDP also features a 14x27 Curl ceramic wall deco with a chic, three-dimensional wave pattern in a glossy finish, adding a bold twist to the classic Calacatta stone look. A full package of trims including bullnose for floor and wall, corners, and a chair rail and stop in a glossy finish complete the collection. The deco tile has a low and high thickness due to its dimension.